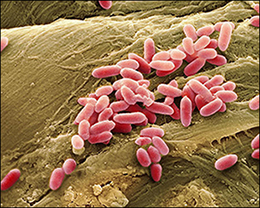 Pseudomonas Aeruginosa is member of the Gamma Proteobacteria class of Bacteria. It is a Gram-negative, aerobic rod belonging to the bacterial family Pseudomonadaceae. It is free living bacterium mostly found is soil and water. It may be found on the surface of plants and animals. It is one of the most common opportunistic pathogen in healthcare associated infections like nosocomial urinary tract infections, nosocomial pneumonia, surgical site infections and nosocomial bloodstream infections. It is the most common cause of gram-negative infection especially in patients with compromised host defense mechanisms. Patients with cancer and those suffering from severe burns and cyst fibrosis are at high risk of getting infected. Pseudomonal infections can be life threatening. It has immense potential to develop resistance against antibiotics. It is a ubiquitous microorganism which has the ability to survive under a variety of environmental conditions. The patient has fever as the most common symptom Pseudomonas Aeruginosa. Pneumonia happens in case of respiratory tract infection. The patient experiences fever, chills, difficulty in breathing, cough with and without sputum. Bacteremia in case the infection reaches the blood stream. The patient experiences fever, chills, fatigue, muscles and joint pain, low blood pressure. The fever and diarrhea may occur due to infection in GI tract. Media and otitis externa when ear is involved. The patient complains of ear ache. In case of eyes infection the patient may experience inflammation, pus, swelling, redness, pain and impaired vision. In case of skin and soft tissue infection the patient experiences abscess formation in the skin, draining wounds and redness of the skin. Other infections include urinary tract infections, Endocarditis in case heart is involved in the infection and Meningitis or brain abscess in case of Central Nervous system infection due to Pseudomonas Aeruginosa. Diagnosis of Pseudomonas Aeruginosa depends on culturing the organism from the site of infection: blood, skin lesions drainage fluid, urine, eye etc. There could be greenish pus and fruity smell in case of localized infections. Other tests like chest radiography, brain CT or MRI, Triple phase bone scanning, renal ultrasonography, echocardiography are performed depending on the individual's case. According to Ayurveda, all problems occur due to imbalance of the three body energies: Vata, Pitta and Kapha. Aggravation of Pitta dosha is responsible for Pseudomonas Aeruginosa infection. The treatment entirely focuses on reducing the aggravated Pita and removing toxins from the body along with boosting the patient's immunity. These capsules are prepared using the pure extracts of Curcuma Longa. The active compound in these capsules is curcumin which helps in fighting all kinds of bacterial infections along with boosting the patient's immunity. These capsules helps with healing process .This medicine acts as a tonic for all body systems like digestive, respiratory and circulatory. It is the best blood purifier and metabolism regulator. Dosage: The recommended dosage for Curcumin Capsules is 2 capsules two times a day after meals with plain water. The pitta dosha governs the metabolism and heat related aspects of our body. As the name suggest the Pitta Balance capsules focuses on balancing the Pitta dosha. The capsules are prepared using an amazing combination of natural components like Mukta Pishti, Praval Pishti, Akisk Pishti, Giloy Satva and Kamdudha. This combination enhances the immune system and eliminates all the toxins from the blood. The product works great in getting rid of skin rashes, acne, heartburn or acidity. Dosage: The recommended dosage of Pitta Balance capsules is 2 capsules two times a day with plain water after meals. 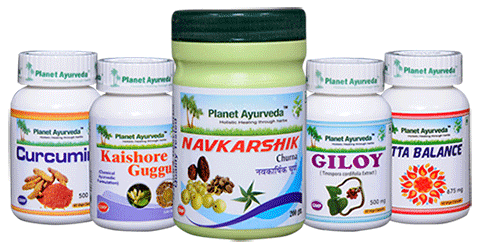 These tablets are prepared using 11 amazing herbs which include Guggul, Guduchi, Amalaki, Haritaki, Bibhitaki, Ginger, Vidanga, Black pepper, Long pepper, Indian Jalap and Red Physic nut. The combination promotes immunity and is highly beneficial in treating skin disorders. Kaishore Guggul is also called pathyadi guggul. It is useful in all inflammatory problems, abdominal diseases and also in treating arthritis. Kaishore Guggul has anti-biotic, anti-inflammatory and anti-microbial properties thus it treats boils, eczema, psoriasis etc. Dosage: The recommended dosage of Kaishore Guggul tablets is 2 tablets two times a day with plain water after meals. These capsules are made from the standardized extracts of herb called Giloy or Tinospora Cordifolia. The herb is known for its anti-inflammatory, anti-bacterial, antiseptic, analgesic and blood purifying properties. The herb is known as AMRIT in Ayurveda because of tis medicinal benefits. The medicine provides strength tp muscles, joints, and bones and also nourishes the brain to carry out its functions in an efficient way. Dosage: The recommended dosage of Giloy Capsules is 2 capsules two times a day with plain water after meals. This product in powdered form is made using a combination of 9 powerful and highly beneficial herbs like Amla, Daruhaldi, Haritaki, Bahera, Giloy, Neem, Katuki, Vacha and Manjistha. The formulation helps in fighting against the bacterial infection. Dosage: The recommended dosage for Navkarshik Churna is 1 table spoon two times a day. To prevent the spread of infection, an approach targeting environmental contamination, good use of antimicrobials, and minimal use of invasive devices is needed. It is advised to perform hand wash hygiene, using hand soaps from non resuable containers and not using soap bars. One needs to cut finger nails short to minimize the spread of infection. In modern medicine, the treatment option is a combination of antipseudomonal bata lactem and aminoglycosides. Surgical may be required for abscess drainage, diabetic foot, malignant otitis etc. As a home remedy, intake of honey and applying honey over the infected areas is recommended. It is a natural antiseptic in the management of wound infections. Intake of Garlic, onion. licorice and ginger is advised. Turmeric should be used on daily bases in the diet.